These Orange coloured Apollo Bio-Fin Pro Fins with Spring Straps come complete with your colour choice of a FREE Apollo mask and snorkel valued at $169. So you get to have the award winning Apollo Bio-Fins that are now the preferred choice of divers from students, to the most advanced technical and military divers, in a great value for money special package offer. Apollo has been making the Bio-Fin Pro for more than 10 years and they're now the world's NUMBER ONE dive fin. During that time, Apollo have expanded the colour range to satisfy just about everybody's colour pallet. They've added the option of a heavy-duty spring strap, which we highly recommend. But in the midst of these modifications, one thing has remained constant, and that is the Apollo Bio-Fin Pro's Top Gun position when it comes to kicking performance and pure comfort. Any way you slice it, the Apollo Bio-Fin Pro is the pack leader. These fins generate ear-bending speed and power with virtually no leg stress, are responsive in turns, and nimble when negotiating tight places. Plus they are comfortable and easy to use. 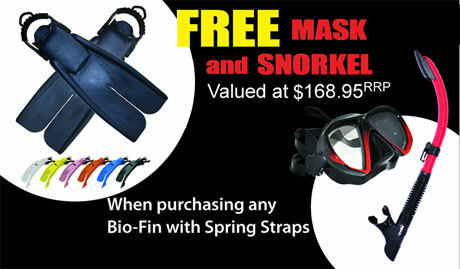 And when Apollo provide a FREE mask and snorkel valued at $169 when you plunk down your money on the Apollo Bio-Fin Pro Fins with Spring Straps, you're getting a great deal as you buy into scuba fin royalty. Spring Straps increase diver safety. Never break a fin strap again! Apollo spring straps totally eliminates the chance of strap, lug or buckle breakage. The Apollo Bio-Fin Pro Fins increase bottom time, improve ability to swim against strong currents, increase comfort and enjoyment, improve performance and comfort on the surface, increase maximum speed, improve cruise speed, improve safety, improve efficiency for free divers, improve performance for underwater photographers, improve efficiency for cave and wreck divers, improve accessibility and efficiency for student divers, and improve accessibility to injured and disabled divers. Apollo began working on the bio-fin design years before it was actually introduced. With any new technology the product must do more than just look and sound good. I must actually work! Apollo were the first to use "Spit Fin Technology" and it had to stand up to their claims. The test results are the proof of just how good the Apollo Bio-Fin Pro is. The Apollo Bio Fin has been voted the best fin since 1999. There are the results from Scuba Diving Magazine’s (Scuba Lab), the world’s premier independent testing facility: "Apollo Bio Fins have consistently out scored all other fins every year. Testers Choice and Best overall fin every year since 1999." The Apollo Bio Fin is the only fin to rate a perfect score from Rodale Magazine, and for good reason - They are great! Apollo Bio-Fins provide lift and propulsion with less effort and more power. Unlike old style fins which ‘push’ water up and down; the Apollo Bio-Fin provides power, lift and forward thrust on each stroke. The Apollo Bio-Fin directs water flow over the leading and trailing edges of the fin blade. The result is lift and acceleration just as in an aircraft wing. The old fin stroke was wide and awkward. Using paddle style fins, the divers body swung from side to side with each stroke and was off centre and unstable, A short natural flutter kick (similar to normal freestyle swimming kick) works best with Apollo Bio split fin technology. Apollo uses only superior materials in the form of 100% natural rubber. In a world where everything seems disposable the Apollo Bio-Fin Pro is designed to last. Indeed they will outlast you and me. Rubber can be a little heavier compared to the plastic used in most fins. However the durability, comfort, flexibility and responsiveness of 100% natural rubber is unique. Your fins are less likely to break the surface, which can cause a loss of momentum that may occur with floating type plastic fins. The Apollo Bio-Fin Pro is designed with a 20 degree angle accommodating the divers natural tendency to blend slightly at the knees in addition to obvious bend at the ankles. This angle is crucial for top performance and comfort. The result is better propulsion and the least amount of stress on the muscle and joints. Apollo's choice of superior materials and intelligent design provides you with quick acceleration and ultimate in power, speed and comfort. Every Model Bio-Fin Submitted to Scuba Diving Magazine (SDM): "Testers' Choice"
The size chart above is intended as a "guide only" to assist in determining your fin size. Actual fit may vary dependent on the type of footwear/boots you are using. If you are between sizes and have a wide foot or thicker sole boot we recommend selecting the larger size. Please Note: All colours are NOT available in all sizes. Please be careful when selecting your size and colour combination. Which Apollo Bio-Fin is Right for You? The Apollo Bio-Fin Pro in Black is produced with a 65 hardness. We consider this the optimum flexibility level. It will provide the least amount of strain on your body, highest speeds, and lowest rate of air consumption. This is the best choice for anyone and particularly for those that need to sustain high speeds for a long period or have foot, ankle, knee, or other leg pain concerns. The Apollo Bio-Fin Pros in Orange, Metallic Blue, Metallic Pink, Yellow and White have a hardness level that varies between 66 to 70. The additional hardness level is a result of adding colour and not specifically to change the feel or performance. The performance of these two colour options is very close to that of Black. Yellow does have a hardness level closer to 70 and out of the water it does feel just a touch more rigid. Some people prefer the Yellow option because the slight increase in hardness level means they can feel it a little when kicking. However, unless you are doing lots, and lots of testing it is unlikely that you would notice the difference between Black, Metallic Blue, Metallic Pink, Yellow or White. It's really just a colour thing! The Apollo Bio-Fin Pro XT is specifically produced with a hardness of 75. It is a much more rigid fin. The Apollo Bio-Fin standards of 100% rubber and 20 degree angle help this fin provide excellent performance, low strain, and reduced air consumption. Some people feel that the more rigid blade makes it respond slightly quicker to direction changes and alternate kicking styles. It is an excellent choice for very strong kickers as the more rigid blade provides a stronger resistance and more traditional paddle fin feel.